2008... WOW - how can it really be? It was only yesterday that we brought in the year 2007. As I sit here and reflect on this past year of creating there are many things that run through my mind. Never did I realize how little discoveries would bring such change to some areas of this crafting industry. In setting goals for this new year I had to ask myself what I was proud of accomplishing this past year in hopes that it would lead me to what I would like to pursue business-wise this next year. I am thrilled with how much you all love the Nestabilities. Being an integral part in the design of these little tools is something I am tremendously proud of. For those of you who didn't realize it, this was in a big way part of my brainchild, so if you don't like them please don't tell me - LOL! OK, so I'm just kidding. It is important for me to hear the negatives as well as the positives so that I can continue towards creating things that really "work". To know that you all appreciate the value, versatility and creative options these offer makes me grin from ear to ear. Knowing how much you appreciate these makes me want to strive to achieve other products that will utilize these three qualities. My next "baby" this year was the COPIC markers. To see the response that has evolved just blows my mind. Research and education are such an important part of who it is that I am. So it once again thrills me to know that I have had a part in bringing a fabulous tool to the papercrafting community. Sometimes there are things out there just waiting to be discovered - they are there, they have been around for many years, but no one really knows about it, being that it's from another "arena". This quality product is a joy to work with and I believe that we are just beginning to discover the beauty we can create with these special tools. I look forward to the year ahead and hope for more time to create, share and educate. So this brings me to a couple of my goals for this coming year - I hope to continue to keep on designing and innovating things that will be useful in your arsenal of crafting tools, I hope to keep educating you as to how to use the products we are involved with, as well as share more of my design education with you all and we hope to continue to provide you with the best customer service humanly possible. So with that I would like to bring in the new year by celebrating - I would like to celebrate each of you. My life is made so much more special each and every day by YOU. The messages you send to me, to all of us here at Ellen Hutson LLC brighten our days - they make us want to work even harder for you and give you the best that we have. They bring smiles to our faces - YOU are special and I would like to celebrate you to begin the start of the year 2008! Just a brief note about this card so that it makes a little more sense. Try turning your Inchies in to an Inchie clip - what a fun way to hold a group of papers together, or put a magnet on the back and attach those notes to your fridge in a much more appealing manner. Be certain to tell the recipient of your card that they need to use their Inchie - LOL! "Cheers to you - thank you all for being here with me!" Cheers and Happy New Year to you Ellen. Thanks for all that you do and share. Hi! I just found your page yesterday when looking for cuttlebug info. Love your happy place pics. Read that you use a pampered chef tool caddy thing, does yours spin well even when full of tools? mine doesn't. thought it was too many tools bet even after lightening up the load its still stubborn. Ellen, you have hit the nail on the head! It is the tools that I have been searching for, and I found them at your site. My first question when I go into a shop is, "what is the latest and great?". Thank you for your beautiful site and the inspiration and especially the nestabilities! I LOVE those things--they were my sole reason and justification for getting the Wizard as I could never justify a die-cutter for myself. THANKS! Ellen, you are a creative problem solver extraordinaire. You have made such improvements in the scraping/stamping world and I am so grateful God blessed you with your creative intelligence. Ellen, I love the nestabilities and you should be so proud of your part in them. The one thing I'd love is if the rectangles were longer and skinnier. Think you could get them to make those? I wish you and your family a healthy and happy new year. You have done an amazing job with your store in one year...that is a HUGE accomplishment. I consider your teaching above and beyond, amazing, and simply fabulous. You are such a giver and I am so grateful to be a recipient of your teaching. Happy New Year Ellen! I'm always amazed at everything you do! Thanks so much for all your hard work with the Nestabilities and Copics. You totally rock! My best wishes for the coming year. I just know you have some wonderful things up your sleeve for us! Can't wait to see what you come out with next! You are an amazing designer and an amazing woman. Thank you for all of the your wonderful inspirtaion. Happy new Year to you and to all of your family. 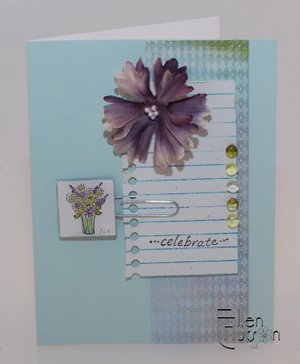 Absolutely gorgeous, Ellen -- love these colors, the lined paper & the spectrum stamping . . . Wow! Happy New Year, Ellen! Thank you for all the work you do educating and providing us with the awesome goods! I look forward to what you have in store for 2008! Thank you for all you do Ellen. Your dedication and love of this hobby is inspiring! Ellen- Thank you for all in inspiration and creativity you have shared over this past year! I look forward to each blog entry and enjoy shopping at your store (been quite a bit of "window" shopping (no pun intended) the past couple of months due to the Christmas bugdeg.) Wishing you a Blessed 2008! P.S. Love the inchie clip idea! Ellen, thanks so much for all the inspiration and your generousity of spirit! I've learned a lot from your blog and use my nestibilities every day. Happy New Year! Ellen - you are the greatest! Whenever I need information on a product, I search your blog first. I have saved everything you have written about the nestabilities and the copics. As I slowly build my stash I return to your info time and time again. Thank you for taking the time to gather the information we need to make wise and useful purchases....I appreciate what you do for us. Thank you. And here's to a wonderful and productive 2008. Ellen - you are one AMAZING woman! I know you've transformed my craft to a new level! Thank you for your brilliance! Wishing you a blessed New Years!!! Cheers to you too, Ellen! It has been a fantastic year for your readers too!